Maryknoll School is a leader in transforming education to prepare students for the careers of the future. Maryknoll’s Chinese Immersion Program, the first in Hawai‘i to take place during the school day, allows students to learn the world’s most widely spoken first language, creating global opportunities for educational and career aspirations. While developing advanced proficiency in a second language, research shows that immersion students achieve the same levels of competence, or better, in academic subjects including English, in addition to many cognitive benefits. Our Chinese Immersion Program is an option for students who will be in grades Kindergarten through Second Grade in the 2019-20 school year. Families may choose to participate in our Chinese Immersion Program or in our traditional Kindergarten, First or Second Grade classrooms. Read more about our Chinese Immersion Program in the Fall 2018 Knoller magazine! Interested in learning more? Let us know! Submit the form and we will be in touch. We also invite you to schedule a time to observe a Chinese Immersion classroom. Mandarin Immersion students will receive daily instruction in a 50/50 model, 50% of each day in Mandarin and 50% in English. Studies have shown that immersion programs develop language fluency and increase students’ standardized test scores and critical thinking abilities across all academic subjects. Immersion results in high academic performance, achieving the same, or higher, in high rigor academic subjects. Tell me more about Chinese Immersion! 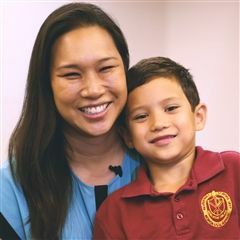 Want to know more about Maryknoll's dual-language development curriculum? Check out our "Myths and Facts" fact sheet to learn more about how immersion benefits children and our dual-language immersion pathway from K-12.